Old part of Dubrovnik is favorite part for tourists. Old part of Dubrovnik is favorite part for tourists. Old Town in fact is the whole one world in small place, there you have just everything you may need: many cultural attractions and most famous are City Walls, Rectors' Palace, Sponza Palace, Dubrovnik Cathedral and the Cathedral treasury, Church of Saint Blaise, Franciscan monastery, Synagogue, Home of Marin Drzic, Ethnographic Museum Rupe, Aquarium, Orlando's column, the Large Onofrio's fountain, galleries, museums, exhibitions, concerts to cinemas, theaters, many cafe bars and restaurants, ... All most important happenings in the town of Dubrovnik are happening in the Old Town, inside the City Walls. The most famous events are Festivity of Saint Blaise, Carnival, Libertas film festival, Dubrovnik summer festival and New Years Eve. One of the most beautiful beaches in Dubrovnik, Banje beach, is just next to the Old Town. There are many shops where you can buy clothes, banks, post offices, pharmacies, hairdressers, beauty centers and also, really famous, open marketwith fresh fruits, vegetables, cheese and may other indigenous products. All these things make Old Town the most famous part of the city for accommodation. But, the Old Town, despite all its positive characteristics, has also a fault for all those who want to enjoy in peace and quiet. During the day, Old Town is full of people and, during the nights, you can hear music and conversation from many cafe bars and restaurants. However, that liveliness, many street musicians and many people, give to this city the soul and one special charm. 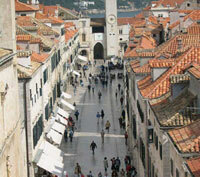 Stradun is the most beautiful, most famous and the widest street in Dubrovnik Old Town. Stradun is only 300 m long, and in the all cross streets take you the stairs. On Stradun are situated some of the most famous cultural attractions as the Large Onofrio's fountain, Franciscan monastery, Sponza Palace, Orlando's column and many others. Also, most of the events are happening on Stradun: Festivity of Saint Blaise, Dubrovnik summer festival and New Years Eve. If you visit Dubrovnik, do not miss to take the walk on the one of the most beautiful streets in the world and feel the real atmosphere of Dubrovnik. Also, it is important to say that in the Old Town you cannot come by car because traffic here is forbidden. You have public parking which is to be paid 10 kunas (cca 1.30 euro) per hour and garage at the vicinity of the Old Town which is 180,00 kuna (cca. 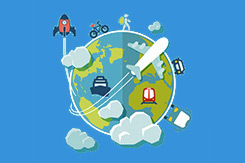 24 euro) per day. It is just 5-10 minutes walking from the Old Town where you will find a parking place for sure. If you want to spend your vacations in peace and quiet environment, far from the city crowds, and also to have nearby all you need during your holidays, Lapad is the best choice for you. This part of Dubrovnik is situated 2-2.5 km from the Old Town. Great bus connections (bus number 6 runs every 10 minutes, the ride takes 10-15 minutes, ticket price is just 10,00 kunas / 1,33 euro and it's valid for an hour) makes Lapad one of the most famous parts of Dubrovnik. Lapad is a small center where you have everything: post office, bank, pharmacy, hairdresser, many small shops and supermarkets, one large shopping center (DOC). Also, there is a large beautiful walking area full of cafe bars and restaurants, at the end of which are many gorgeous beaches. In the part of Lapad called Babin Kuk you can enjoy in many sports activities such as volleyball, handball, tennis, and on Lapad there is also cinema Lapad and many restaurants. There is also one of the biggest and most beautiful beaches in Dubrovnik, Copacabana, bay of Lapad, beachs Neptun and President and nudist beach Cava. Gruz is part of Dubrovnik which is really popular because there is situated the Port of Dubrovnik, in which comes all the ships which come to Dubrovnik. 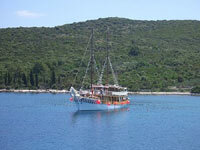 From Gruz every day many tourists go by boat to the nearby islands of Sipan, Lopud and Kolocep. Dubrovnik main Bus Terminal is also situated in Gruz. Gruz has also very good connection with the other parts of Dubrovnik (bus number 7 drives to Lapad, buses number 1A and 1B drive to the Old Town, ticket price is 10,00 kunas / 1,33 euro and it's valid for an hour). In Gruz you have many restaurants, cafe bars, pharmacy, large shopping center, many small shops, large trade center Konzum, tourist information center ... In Gruz is also the biggest Dubrovnik open market on which every day you can buy fresh fruit and vegetables and various fresh fish. Part of Dubrovnik which is really on a great location, close to the Old Town and still far enough, with an amazing view to the sea, is called Gorica Svetog Vlaha. This part of Dubrovnik is situated 1-1.5 km from the city center and has great bus connection (bus number 4 drives every 20 minutes, the ride takes 5-10 minutes, ticket price is just 10 kunas / 1.33 euro and it's valid for an hour). On Gorica Svetog Vlaha you can enjoy in many cafe bars which are favorite among young people in Dubrovnik. The most beautiful beach in this part of the city is beach Bellevue - beautiful sandy-pebble beach. If you want to book the accommodation close enough to the Old Town and not to use the bus, definitely Gorica Svetog Vlaha is the right choice for you. Pile is part of Dubrovnik which is, in fact, the entrance to the Old Town from the west. 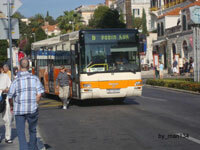 That is the most vital part of the city because from that is starting point for most of local buses to other parts of Dubrovnik. There is also taxi stop on the Pile. Pile consists of many cafe bars, restaurants, supermarkets, tourist information center, Internet center. There is also the beach Dance and one of the most famous night clubs in Dubrovnik - Latino club Fuego and night club Capitano. 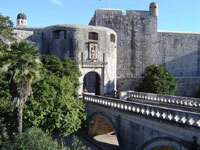 In the history Pile had a very significant geo-strategic importance for Dubrovnik, so there is also the Fort Lovrijenac. 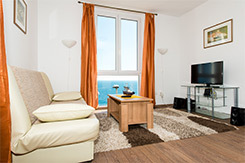 If you want to book the accommodation close enough to the Old Town and not to use the bus, definitely Pile is the right choice for you. Ploce at the entrance to the Old Town Ploce is part of Dubrovnik which is, in fact, the entrance to the Old Town from the east. There are cafe bars, supermarkets, bus station where stop buses number 5 and 8, taxi stop ... On Ploce there is the most popular Dubrovnik beach Banje and beautiful beach Sveti Jakov. Also there is night club East-West on Banje beach. If you want to book the accommodation close enough to the Old Town and not to use the bus, definitely Ploce is the right choice for you. Traffic in the Old Town (inside the City Walls) is forbidden. 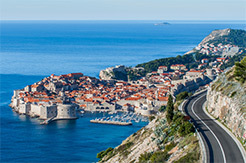 As far as traffic outside the City Walls, Dubrovnik is very well covered by taxi service. 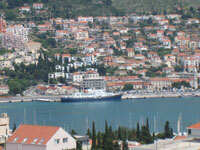 There are taxi stops on the both sides to the Old Town, at Pile Gate and at Ploce Gate. 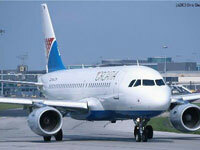 Phone number of taxi service is 00385 (0)20 970 and it works every day 24 hours a day. 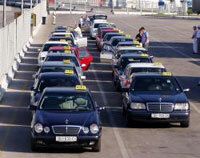 It is very useful to know that start of driving is 25,00 kunas (3,33 euro). Also, you can use local bus service Libertas. There is bus station on Pile from where almost all bus lines leave for all parts of the city. Ticket price is 10,00 kunas / 1,33 euro and it's valid for an hour. You can buy ticket at any tobacco shop (price 10,00 kuna = 1,33 euro) or in the bus (price is 12,00 kuna = 1,60 euro). From Dubrovnik old harbor you can go to Cavtat and on the island of Lokrum. Boats are driving few times in day, depends of the day in week. 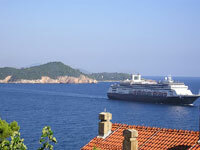 From Dubrovnik main port, Gruz, there are every day ferries to the islands Kolocep, Lopud and Sipan. Ferry boat from Dubrovnik Port in Gruz drive few times in day and stop first on the island of Kolocep, then Lopud and at the end they drive passengers to the island of Sipan. If you decide to visit these beautiful Dubrovnik islands (known as Elaphite islands) do not miss to visit famous beach Sunj on the island of Lopud and beach Gornje Celo on the island of Kolocep. 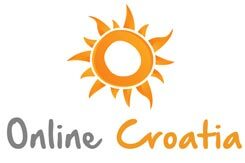 Depending of the month and the day in a week (it is different during the weekend and during the week), last return from the islands to Dubrovnik is around 20:00 o'clock. Ticket price is around 2,00 euro. or phone number 060 31 33 33 or from abroad 00385 1 611 2789. The southeast larger town you can get by train is Split. There is no train down to Dubrovnik.